Labrador retrievers are some of the most loyal, loving and helpful dogs that you can add to your family. However, if you have any experience with labs, then the chances are that you know of the many ailments that could potentially affect your pup. One of the most common conditions that labs – and other larger dog breeds – experience is hip dysplasia. What is this issue and how can it be avoided? Hip dysplasia is caused when the ball and socket joint within a dog’s hip isn’t properly formed. In a nutshell, it means that socket and the ball portion of the hip don’t meet each other as they should. As PetMD notes, this results in a joint that harshly rubs and grinds rather than moving smoothly as it should. This ailment is more common in larger dogs like labs, but also affects breeds like great danes and German shepherds. This us because these bigger dogs weigh more and work their legs and hips much more than smaller dogs do, so even a small deformation can be exaggerated more rapidly than in tinier species. While hip dysplasia often develops while dogs are younger, it can occur later in life, leading to a chronic pain, loss of joint cartilage and impaired or reduced mobility. How Can Hip Dysplasia be Addressed? There are several ways to treat or at least quell the pain associated with hip dysplasia. Surgery is one option, depending on the severity of the damage and other physical factors like your dog’s size, age and your dog’s lifestyle – aka whether they are a hunting or service dog or a family pet. Surgery isn’t always recommended or necessary, however. There are several other ways to help your dog cope with this condition. Swimming is an excellent way to help your pup because it allows him or her to work the muscle and joint without causing additional stress. Weight management is another crucial step in preventing the condition or alleviating the pain that occurs if your dog already has it. The more weight your dog is placing on its legs and hips, the better the chance of pain and suffering, so work with your veterinarian to come up with a diet plan that will work for your four-legged friend. While there are ways to treat and care for a pup with hip dysplasia, the best way to ensure that your dog avoids the possibility of suffering from this or any other condition is to purchase your dog from a qualified breeder that genetically screens dogs to eliminate the risk of hip dysplasia. At KT British Labs, we do just that, performing genetic testing and assessments of our breeding dogs for not only hip dysplasia, but also many other common ailments, including exercise-induced collapse (EIC) and many other health concerns. All of our breeders are certified to be healthy and free of orthopedic and vision concerns, plus all our puppies comes backed by a written health guarantee, so you know that you are getting the best. 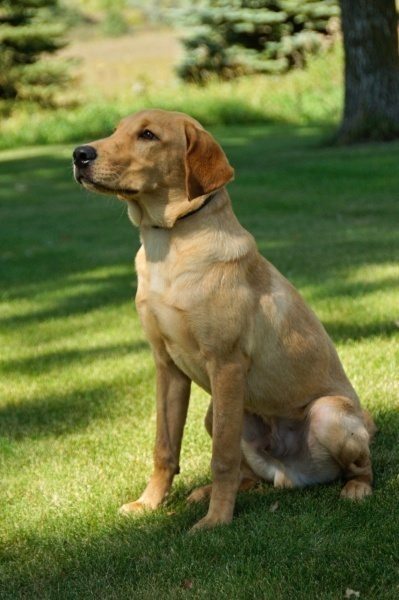 Learn more about our British Labrador retrievers today by calling us at 218-685-5103 or reserve an upcoming puppy online now.